Yay! It’s Friday! Today we have a really fun project to share. It’s a Balloon Marquee! 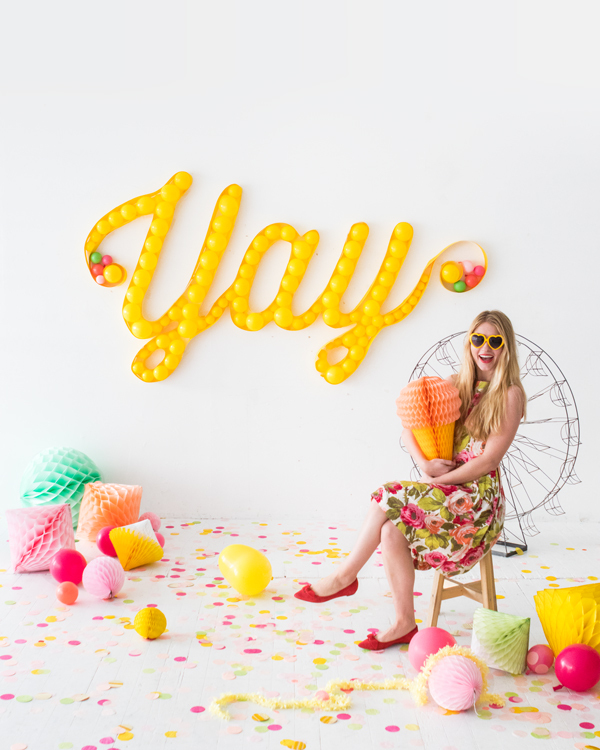 This project would work well for someone’s birthday or wedding decor. 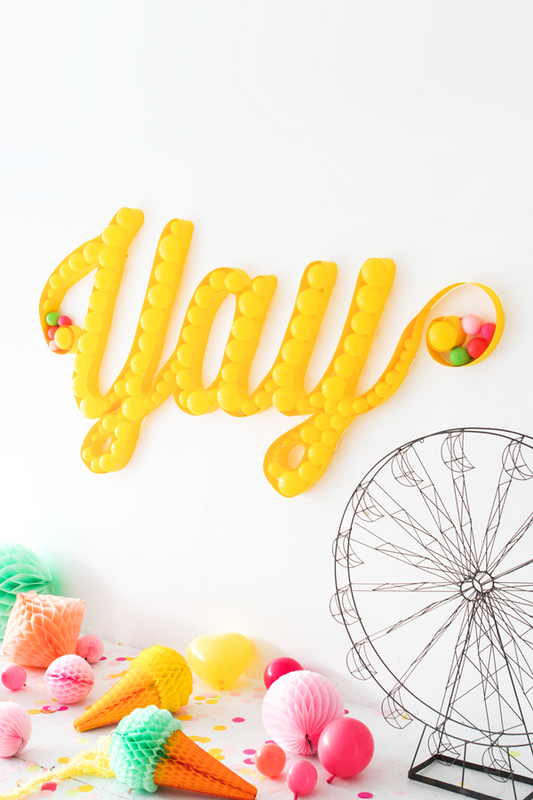 We made this differently than some of our other balloon walls by first attaching a frame out of cardstock, then filling it with tiny balloons. The texture of all the balloons turned out really great. See how to make it below! Step 1: Search online for a cursive typeface. Download the font and, using a word processor, type your word as large as possible. 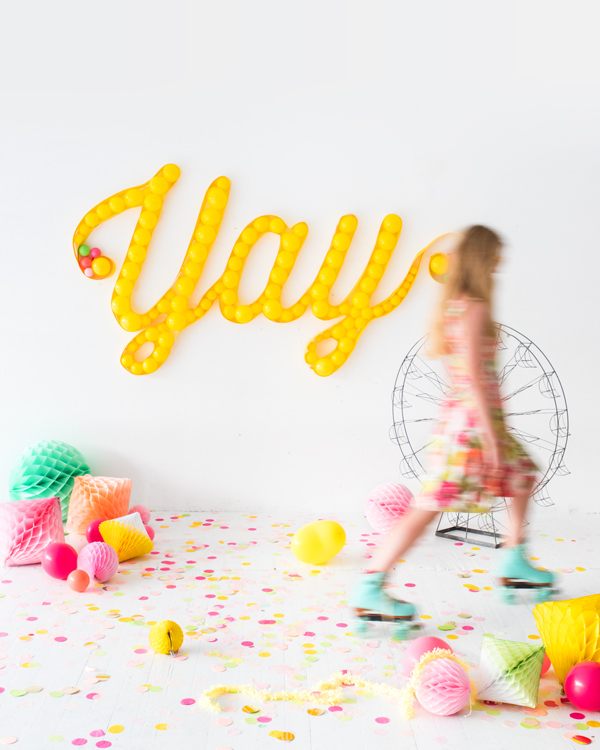 Project the word onto a large, blank wall and trace lightly with pencil. Step 2: Using a ruler and x-acto knife, cut a bunch of 3” strips out of cardstock. Step 3: Hot glue 6 strips together to form one long strand. Repeat to make additional strands. Step 4: Cut out small tabs and fold in half (about 1-½” long). You will use these tabs to tape the cardstock to the wall. Step 5: Stick one end of a tab to the edge of the long cardstock strands with double sided tape. Tape the other end of the tab against the wall with a piece of gaffers tape. Step 6: Shape the cardstock along the traced outline of the word, occasionally using tabs to keep the strands in place. Once your strand has run out, use double sided tape to attach another cardstock strand for more length. Step 7: Inflate a bunch of mini balloons in various sizes with a balloon hand pump. You want the balloons to have a round shape so they look more like lightbulbs. Step 8: Apply vertical lines of double sided Shurtape on the inside spaces of the letters. 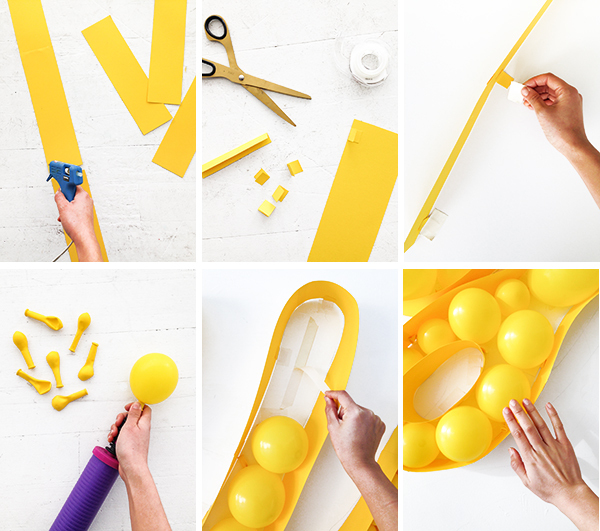 Peel off the paper backing and stick on balloons. 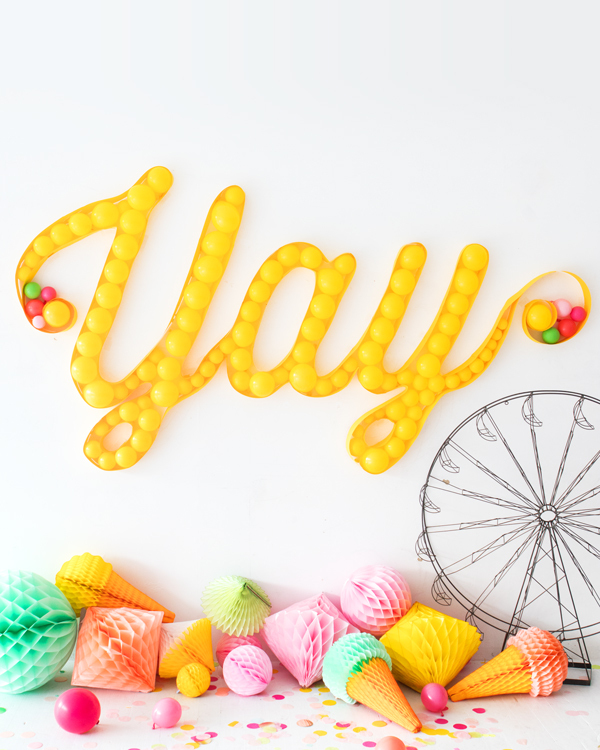 Add small balloons in a few colors to the beginning and ending flourishes of the word. Yay, you’re done! This is an amazing idea, and it looks so cool! I’m impressed how resourceful you were in making this. 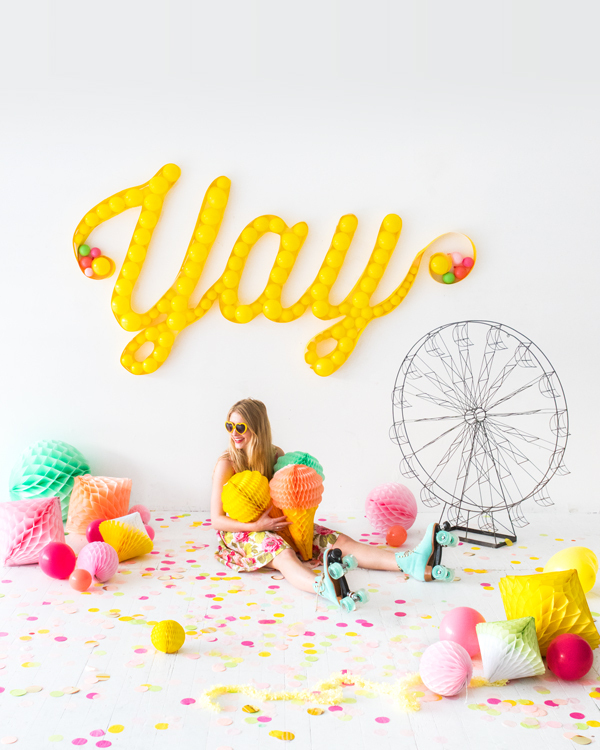 Love the balloon marquee its a conversation piece! This is such a cool idea! Love it! 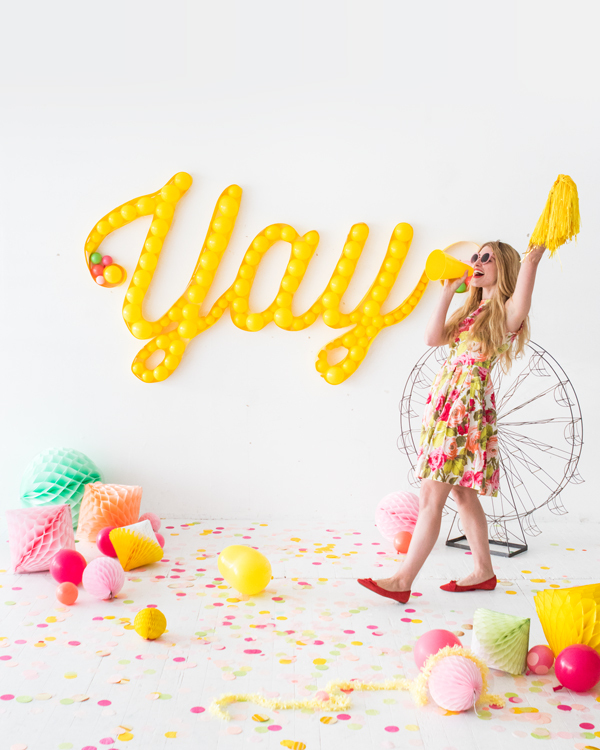 Such incredible balloon decorations – sure to add an extra element of fun and festivities to any party theme! I’s great getting creative and going all out for party themes and decorations. A fun addition to this theme would be dressups in a selected colour range or having a photobooth to capture the festivities! Love this a lot!!!! I love the Ferris wheel prop, where is that from? It’s from a vintage store!